Just like her superhero name, Susan Storm can render objects invisible like her bowls of cat food! 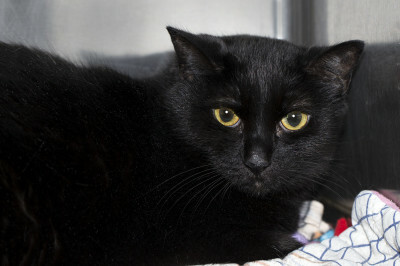 She would love to show you what a great kitty she is – this stunning gal is not happy with so many shelter roommates and we all know that outside of this environment she will be the happy, loving lap cat she once was. Perhaps in a new home with more space and a slow introduction, Susan might fit in with another cat. This ‘full of life’ kitty is just waiting for the right person to come in who will appreciate her spirited personality.